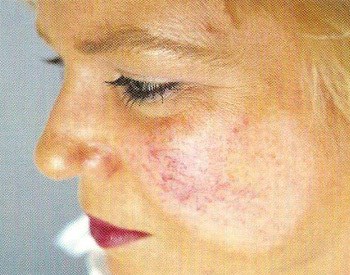 Telangiectasia is an increase in the size of small blood vessels beneath the surface of an area of skin, causing redness and a "broken veins" appearance. It is most commonly found on the nose and cheeks. There may be no obvious cause for telangiectasia, or the condition may be caused by many years of excessive alcohol consumption, the skin condition rosacea, overexposure to sunlight, or a disease of connective tissue, such as dermatomyositis. Telangiectasia is not a cause for concern, but if very unsightly the veins can be removed in some cases by electrodessication (electrical destruction of the upper layers of the skin) administered by a dermatologist or by laser treatment.